I had a great week skiing in France, well apart from a gastronomic misfortune, but more of that later. Running took a back seat this week, fewer than 20 miles covered, mainly very slowly. As I mentioned in the previous post, I flew out very early on Monday morning from Liverpool John Lennon Airport and spent a day on my own in Geneva whilst waiting for my mate Tim to fly in from Heathrow at tea time. Geneva Airport is very close to the city centre – only a couple of kilometres and its a free train ride directly from the airport which takes 4 minutes and runs every 12 minutes. Integrated transport – an interesting concept, I wonder if they will ever try that in the U.K. 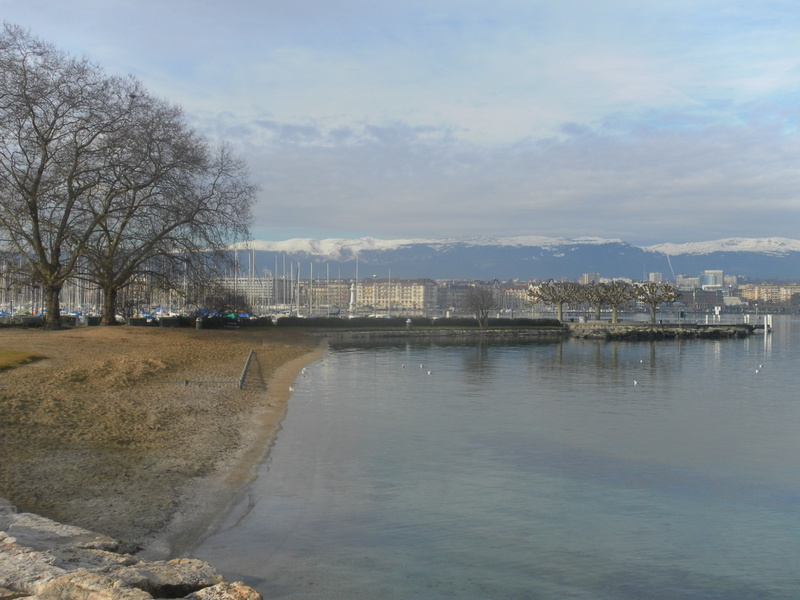 I meandered around the City and then took myself off for a walk along the shore of Lake Geneva at Lunchtime. There were loads of lunchtime runners taking advantage of the weather and the beautiful surroundings. I couldn’t help but think that Lake Geneva would be an amazing place to hold a parkrun. After an hour or so’s walk, I sat in a little bar for a couple of hours in the afternoon, enjoying reading my book, watching winter sports on Eurosport and drinking a couple of beers. Tim’s flight arrived on time and he drove our hired VW Golf down to Val Thorens as if we were trying to make up time in the Monte Carlo rally. The snow was still great up in VT, even though the weather was unseasonably warm for January. At 2500 metres altitude in January, one would expect it to be well below freezing all the time, however the conditions were springlike – the temperature was easily 6 or 7 degrees in the afternoon and it felt warmer in the sun. Lower down the snow was slushy in the afternoon. 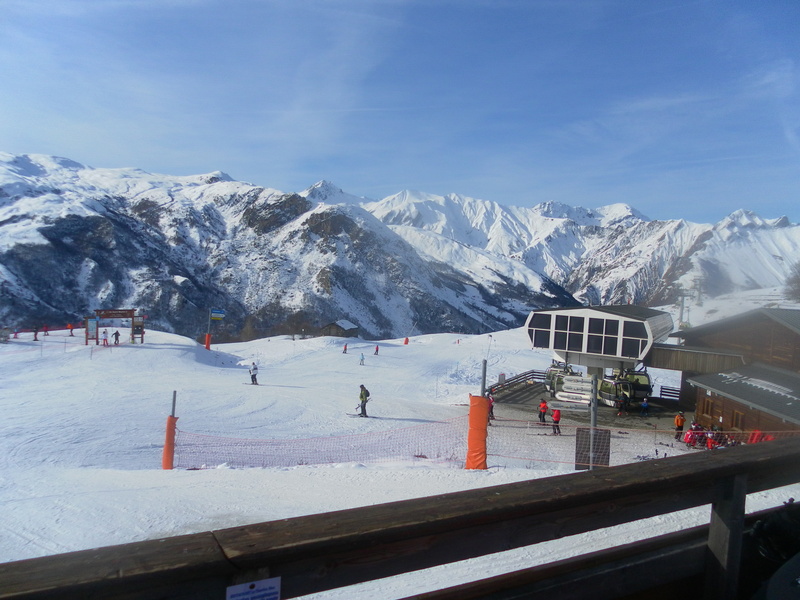 We had two big days of skiing, especially on the Wednesday when we got out early and did a massive tour of all of the Three Valleys – skiing runs in Val Thorens, Les Menuires, St Martin de Belleville, Meribel, Mottaret and all of the Courchevel villages. By three o’clock and still in the far runs above Courchevel, we realised it would be touch and go for us to make it back over to Val Thorens Valley before the lifts closed and after taking one incorrect run, I thought we had blown it. With some hard skiing and thankfully no queues, we made the last lift climb up to Mont de la Chambre above VT with about 6 minutes to spare before it closed. It was a brilliant and exhausting day. That night we chose a poshish looking restaurant and I ordered Lasagne. It didn’t look great when it was served and it didn’t taste brilliant either. Maybe they had bought in a cheap load from Tesco last year. I was so hungry that I ate it, but later that evening I regretted that decision. I was up all night, mostly spent in the bathroom. Oh dear. I still felt terrible on Thursday, but ventured out to accompany Tim, but I had no mojo for skiing . Sliding down a steep mountain when you feel sick and weak is no fun and I had a couple of minor falls due to tiredness and lack of mojo. We flew back on the late flight out of Geneva on Thursday evening. All was going well until the landing back at Liverpool. I had a window seat on the left side of the aircraft behind the wing. As we landed I though the white line of the edge of the runway was very close, in fact it was getting closer and closer as we ran out down the runway, my goodness, we were headed for the grass! Just then the plane accelerated aggressively and took off again! Cue lots of wisecracks from the Scousers on board and a rather strange message from the pilot that a Trainee pilot had attempted a landing, it wasn’t going well, so he had decided to abort the landing. Thankfully, the second landing was without incident. The running after my return from holidays has been very flat. After a gentle off road 8 miler on Friday, I had hoped to run a strong parkrun at Leeds on Saturday morning, thinking that all the skiing had improved my leg strength and speed. After about 1km, I realised that this wasn’t going to be a good run, I felt a little light headed and very heavy legged. My usual peers and rivals were running strongly away from me and I had nothing in the tank. I guess the effects of the food poisoning and the heavy week were still with me. After about 2k, I mentally jacked in racing and converted to training mode. I finished in 19.44 – Nearly two minutes outside my PB, but I guess a sub 20 minute 5K is OK given that I was feeling a bit below my best. It was Peco XC race 3 on Sunday at Middleton Park, but still feeling under the weather, instead I set out for a very slow long run around Fewston and Swinsty reservoirs . I intended to do a 13 or 16 mile run – being two or two and half laps. Again, it just wasn’t there and rather than battle on, I jacked in after just one lap and 6.5 miles at just over 8 minute miles. Next Sunday is the Brass Monkey half marathon. Hopefully I will feel better by then. With 12 weeks still to go until the marathon, I don’t think this disappointing week should have a major disadvantageous effect on my chances.